About JUEE: Jagannath University Entrance Examination [JUEE] is a University Level Entrance Examination conducted by Jagannath University, Rajasthan for admission into various Undergraduate, Postgraduate, and Ph.D. Courses. 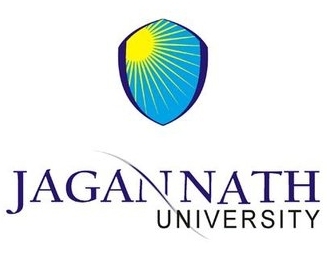 About Jagannath University: Jagannath University has been established in the year 2008. by an Act (Act No. 19 of 2008) of the Rajasthan State Legislature and is approved under section 2(f) of UGC Act 1956, vested with the authority to award Degrees, Diplomas, and Certificates. Conducting Body: JUEE will be conducted by Jagannath University 3 times (April, May, and June) a year. Level: JUEE is a University Level Entrance Examination for admission into various Undergraduate, Postgraduate, and Ph.D. Courses. Mode & Date: JUEE 2019 will be conducted offline i.e. Pen and Paper-based Test (PBT) for 3 times in a year on 15th April 2019, 20th May 2019, 17th June 2019. 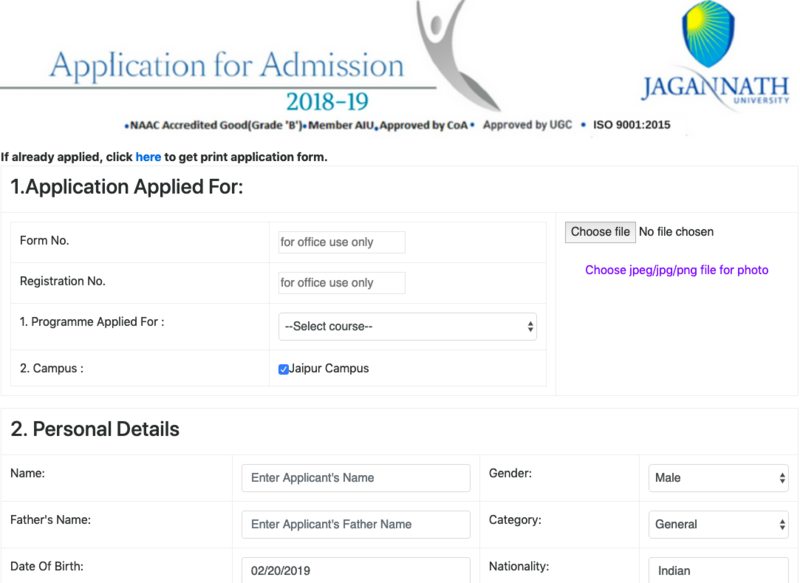 Registration: Application Form is available on the official website of Jagannath University from 1st February 2019 and the last date to submit the Application Form will be on 7th April 2019. Admit Card: The Admit Card will be released online for all the aspirants on 10th April 2019. Examination: JUEE 2019 will be conducted offline i.e. Pen & Paper-based Test (PBT) on 15th April 2019, 20th May 2019, 17th June 2019. Results: Results will be declared on the official website for all category candidates based on qualified marks on 25th June 2019. Counselling: Candidates who clear the JUEE 2019 will be called for the counselling process which will be held on 1st January 1970. Undergraduate: The candidates must have passed 10+2 examination with minimum 45% marks from a recognized Board of Education. Postgraduate: The candidates must have passed a Bachelor Degree in a relevant stream with minimum 50% marks from a recognized Institute/ University. Doctorate: The candidates must have passed a Master Degree in a relevant stream with minimum 55% marks from a recognized Institute/ University. Registration Fee: Candidates have to pay the registration fee online (Debit Card/ Credit Card/ Net Banking) and offline (Demand Draft drew in favor of “Jagannath University” payable at Jaipur). Documents Upload: Candidates have to upload the scanned copy of passport size photograph at the beginning while filling the Application Form. Step 1: Register yourself with the Name, Email, Mobile Numbers, Password, Course, State, and City then submit. Step 2: The Email and Mobile Number will be verified for future reference. Step 3: Now fill the Application Form with the valid details such as Personal, Academic, Contact details. Step 4: Pay the Application Fee through online (Debit Cards/ Credit Cards/ Net Banking) or Offline (Demand Draft in favor of 'Jagannath University’, payable at Jaipur). Step 5: Upload the necessary document along with the Application Form and submit it. Step 1: Download and take a printout of the Application Form from the official website of Jagannath University. Step 2: Fill all the necessary details mentioned in the Application Form. Step 3: Attach the Hard copy of all the documents necessary with the Application Form. Step 4: Pay the Application Fee by Demand Draft in favor of 'Jagannath University' payable at Jaipur. Centres: Jagannath University Entrance Examination will be conducted in 2 centres of the same University (Jaipur and Delhi). Choice: Candidates are allowed to choose the test centre while filling the Application Form. Id Proof: Candidates must carry the Admit Card along with a Government Id proof to the Exam Centre. IP-2& 3, Phase IV,Sitapura Ind. Area, Opp. Chokhi Dhani, Jaipur, Pin-302022 (Rajasthan). Availability: JUEE 2019 Admit Card will be available on the official website from 10th April 2019. Download: Candidates should download the Hall-Tickets from the University website. How to Download JUEE 2019 Admit Card? Step 1: Visit the official website of Jagannath University. Step 2: Click on the ‘Download JUEE 2019 Admit Card’. Step 3: Enter your Application Numbers and Password as Login credentials. Step 4: JUEE 2019 Admit Card will be displayed on the screen. Step 5: Download it and take a printout of Admit Card for future assistance. Note: Candidates must preserve their Admit Card till the admission process gets over. Mode: JUEE 2019 will be conducted offline i.e. Pen and Paper-based Test (PBT) on 15th April 2019. Topics: JUEE 2019 will comprise of the topic from Physics, Chemistry, and Mathematics. Subjects: The syllabus for JUEE will comprise of topics from Physics, Chemistry, and Mathematics. Reference Books: Candidates can look through the reference books which are prescribed by the conducting authority for the preparation. Scorecard: The result will be displayed in the form of scorecard for all the candidates where they can download and take a printout for future reference. Step 1: Visit the official website of "Jagannath University"
Step 2: Click on the link which has "Results 2019" on the right top corner. Step 4: The result will appear in the screen with the marks of each section separately. Step 5: Candidates can download and take a print of it for future reference. Candidates who clear the minimum cut-off will be called for Counselling or Interview. Scorecard and Admit Card of JUEE 2019 or Qualifying exam. Detailed Marks certificates of Class 10 and 12. Colored Passport sized pictures of the candidate. Migration or Transfer Certificate of Candidate from previous board/university studied. Other legal documents such as Income Proof, Category Certificate etc.